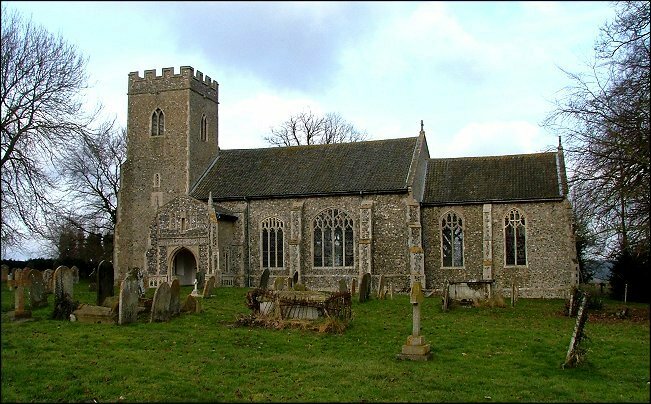 Anyone who has seen the cover of Richard Tilbrook's lovely book Norfolk's Churches Great and Small will remember the evocative image of a country church seen from across a field of poppies. 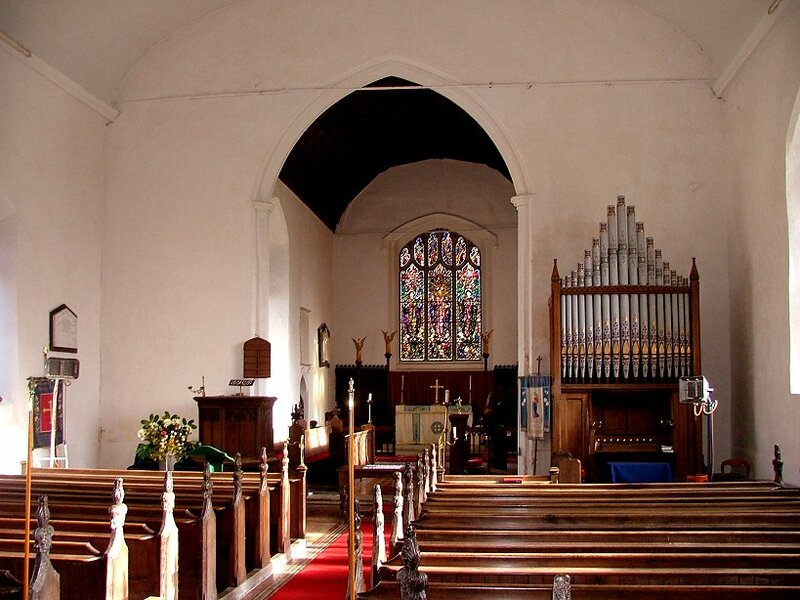 The church is All Saints, East Tuddenham, and it is a mark of the keenness of Tilbrook's eye that East Tuddenham is actually a rather suburban place, its church out at one end of the long, straight high street. 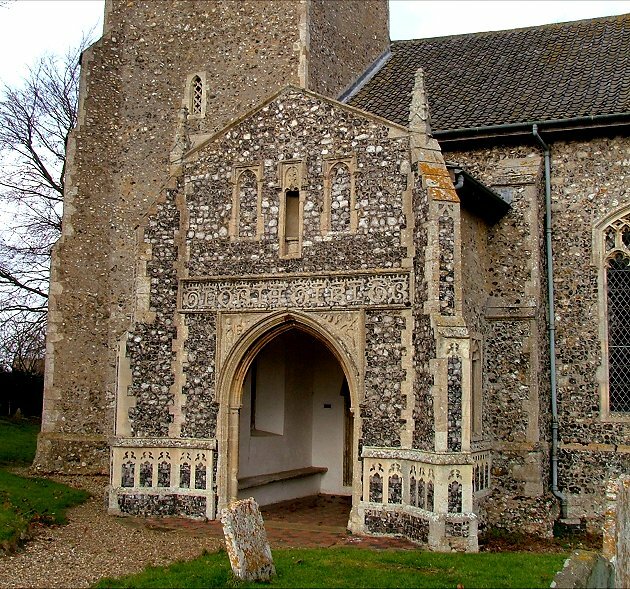 Tilbrook, who died last year, has left a marvellous legacy in the form of hundreds of photographs of Norfolk and Suffolk churches. 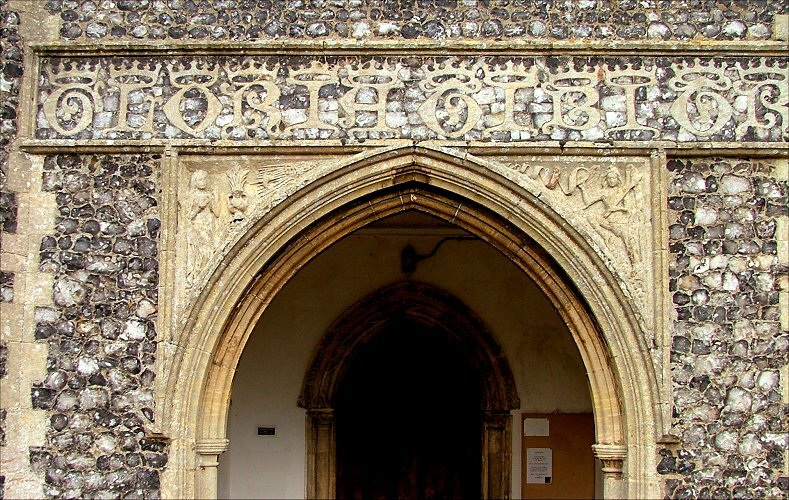 The Norfolk book and its Suffolk companion barely scratch the surface, and anyone who has been to one of the exhibitions where the large scale prints (often a metre wide) are exhibited will know that he was probably one of the best photographers of churches that England has seen. However, on this dull winter's day I fear that even Richard Tilbrook would have struggled to make All Saints graveyard an attractive place. The icy wind sent clouds scudding across a washed out sky, and even the naked trees seemed to shiver. 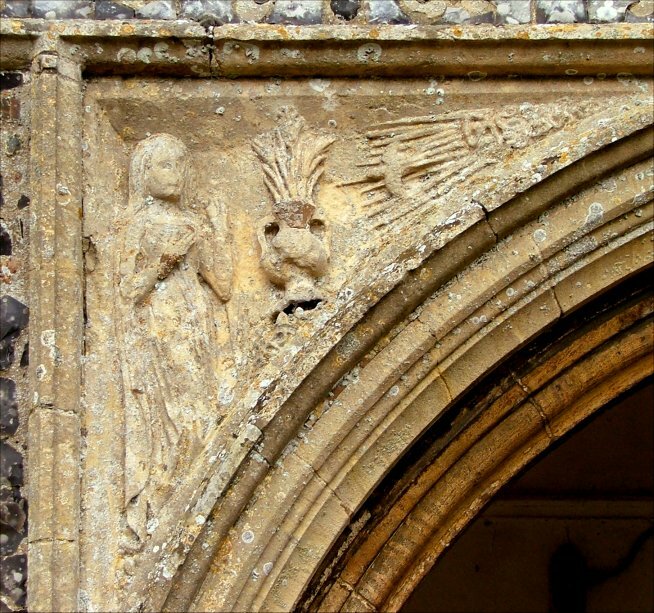 The most interesting aspect of the exterior, given that there were no poppies to be seen, is the face of the south porch. 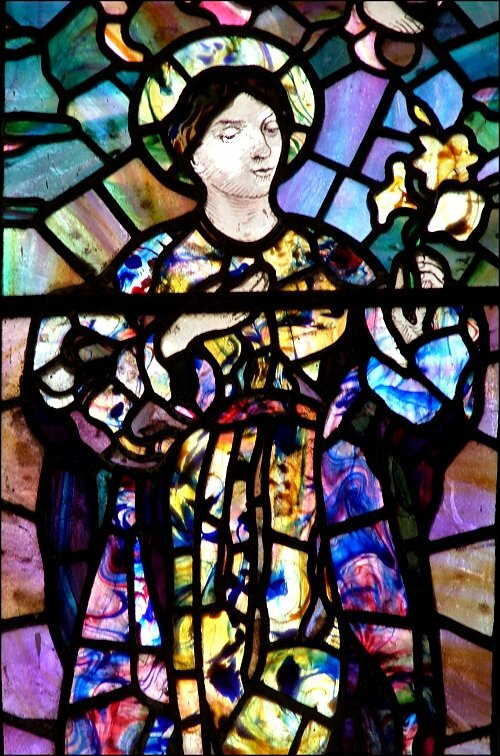 The spandrels have a beautiful Annunciation scene, with an Archangel who really seems to have sprung to earth in glory; his words to her are on an unfurling banner, his head as proud and erect as the lily in his hand. Gloria Tibi Tr(initas) it reads in beautiful crowned letters in the flushwork across the top. The 13th century tower is accompanied by a nave and chancel that appear wholly Perpendicular, except that there are no aisles or clerestory; did the 15th century just add big windows and new roofs to an already existing building? But that can't be right, because the tower sits in the south-west corner, so at some point the church has obviously been extended northwards. 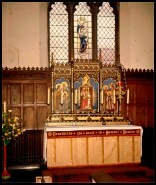 The chancel sits in the middle of the east wall, so it must be later than the south side of the nave. 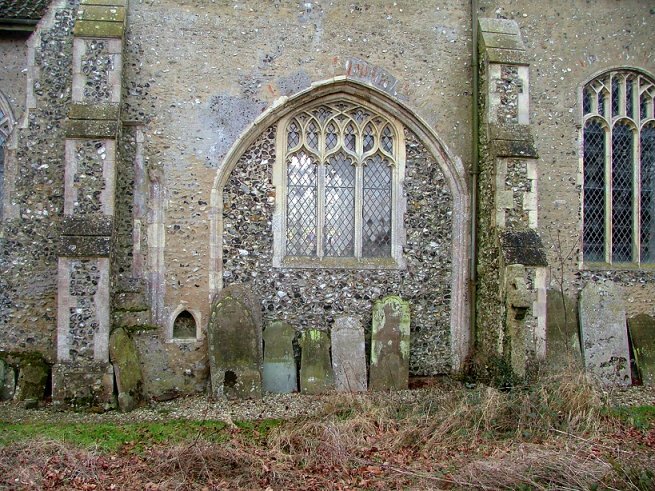 We may surmise that the south wall is in its original place because the main doorway on this side is late Norman, perhaps early Early English. 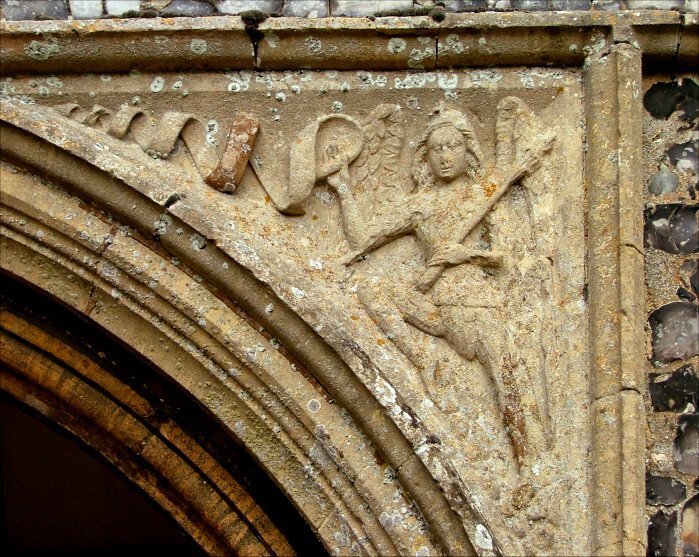 On the north side of the church is the remains of an archway that must have led into a transept; there is even a little piscina beside it, now outside the church. It is all a bit of a puzzle, but interesting enough for you to make up your own idea of what happened here. You step in through the ancient doorway and find, as you'd guess, that All Saints feels wide inside. The absence of arcades means that this is a square, light space. Bold white walls throw into relief colourful details. 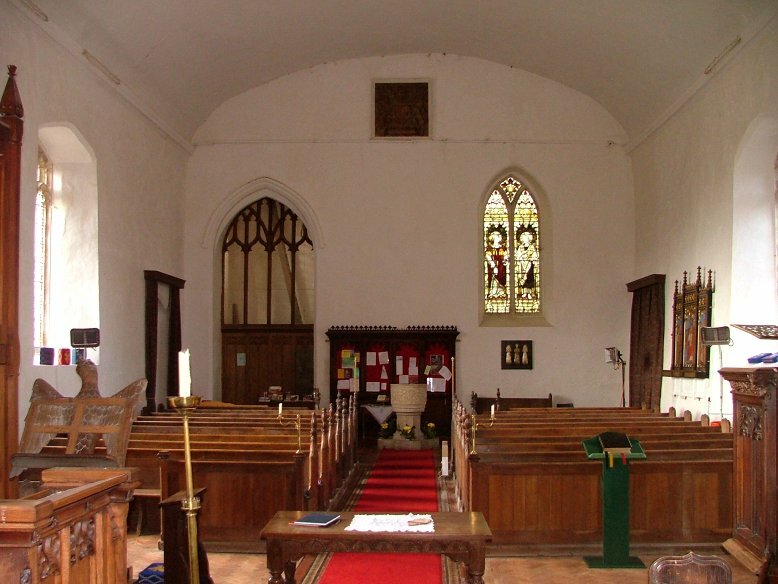 The off-centre tower arch is matched across the church by a two-light window, and the barrel-roofing of the chancel is a nice counterpoint to the woodwork of the nave. 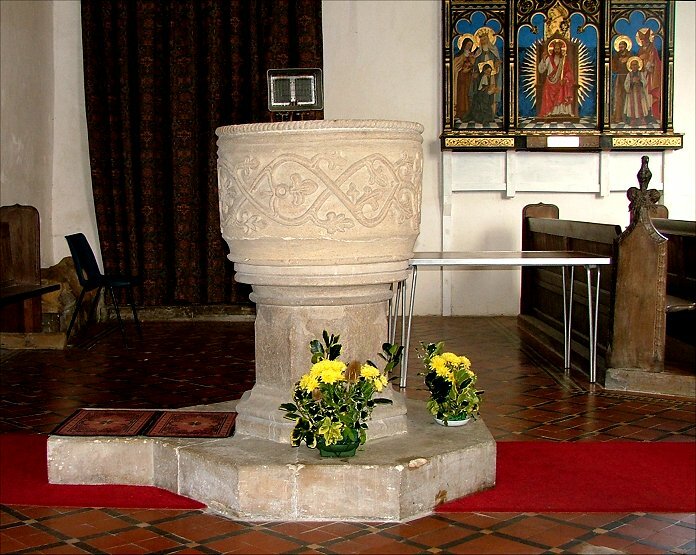 The font is unusual for East Anglia, in that it is circular; vines and foliage twist around it. 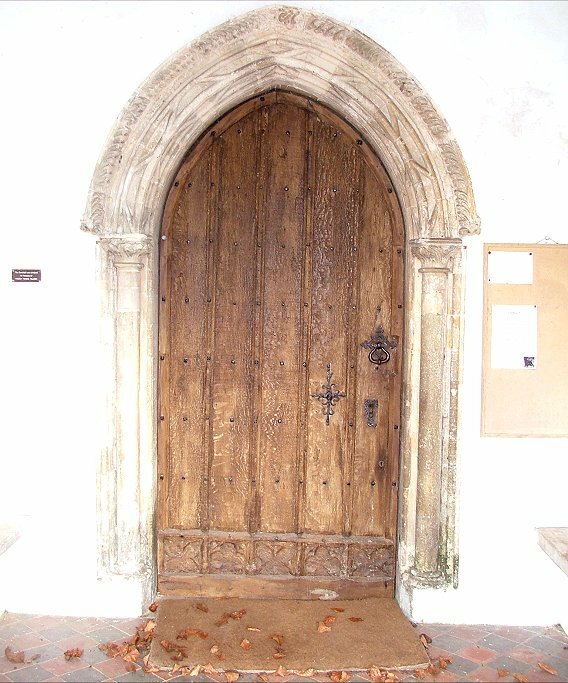 Pevsner thought it late 12th century, which means it is probably contemporary with the doorway. Perhaps they were crafted by the same hands. 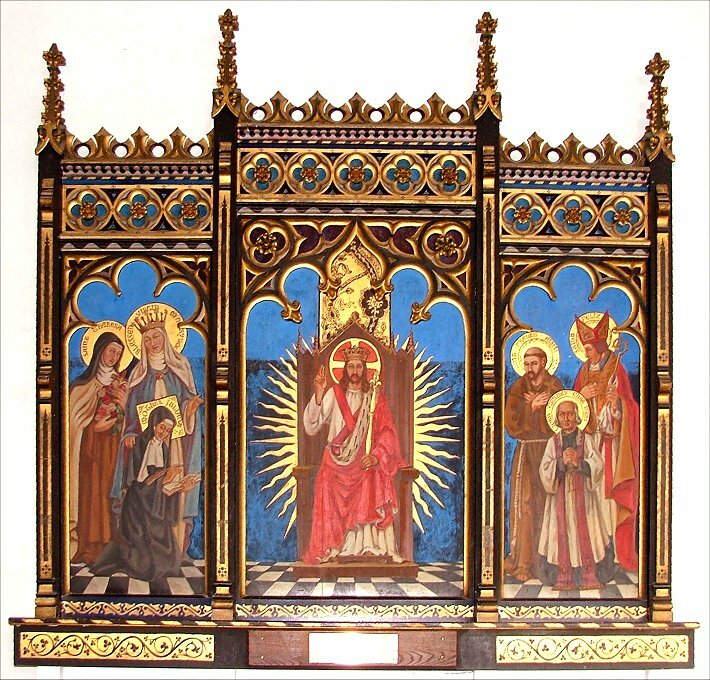 As you come in, there is a startling early 20th century triptych in the very highest possible Anglo-catholic taste. 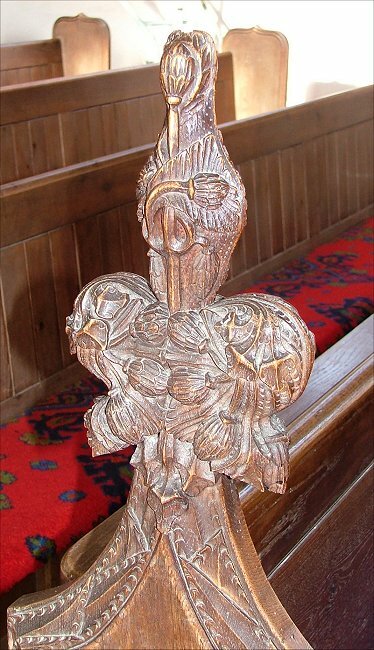 Christ is seated in majesty in the middle, and three figures adore him on each side. 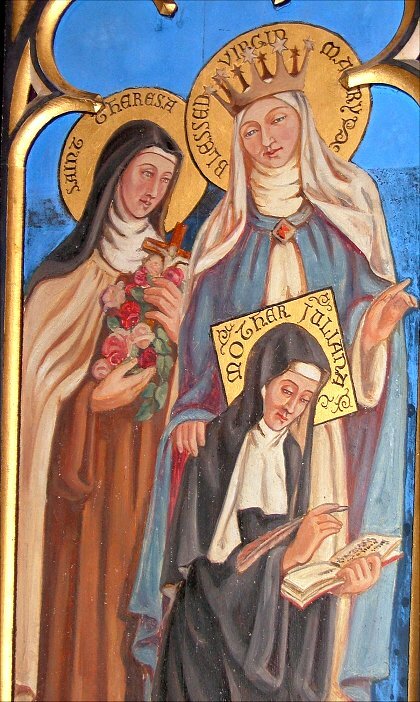 To the left are St Therese of Lisieux, Mother Julian of Norwich and the Blessed Virgin Mary. 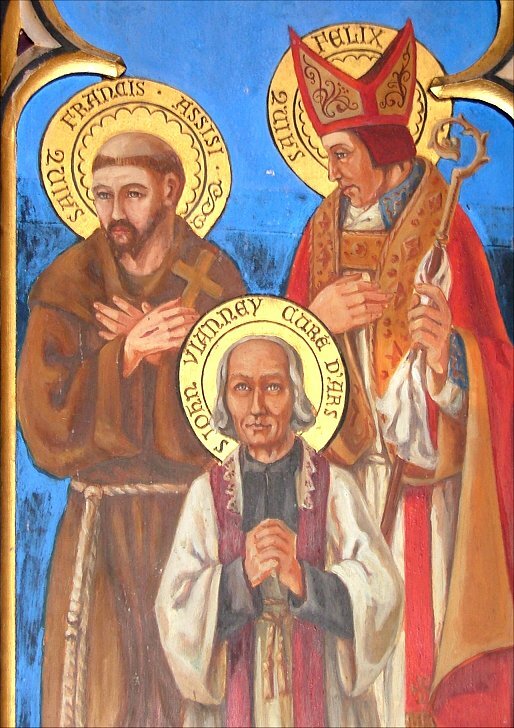 On the right are St Francis, St Felix and St John Vianney. A curious assortment, and one you'd be unlikely to find often in the same piece. 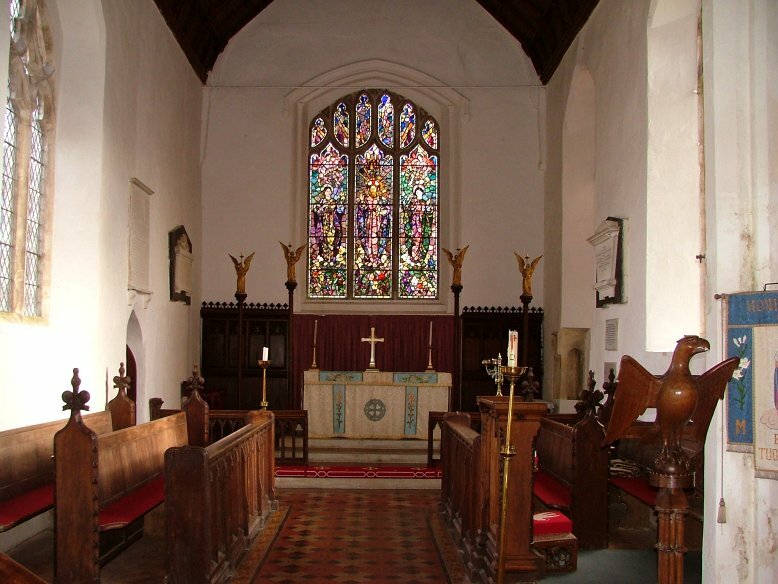 It seems quite out of place at East Tuddenham, which is hardly High Church, and it is only here because it was presented as a gift. It originally comes from Norwich All Saints, one of the Anglo-catholic hotspots of that city, which was declared redundant in 1973. 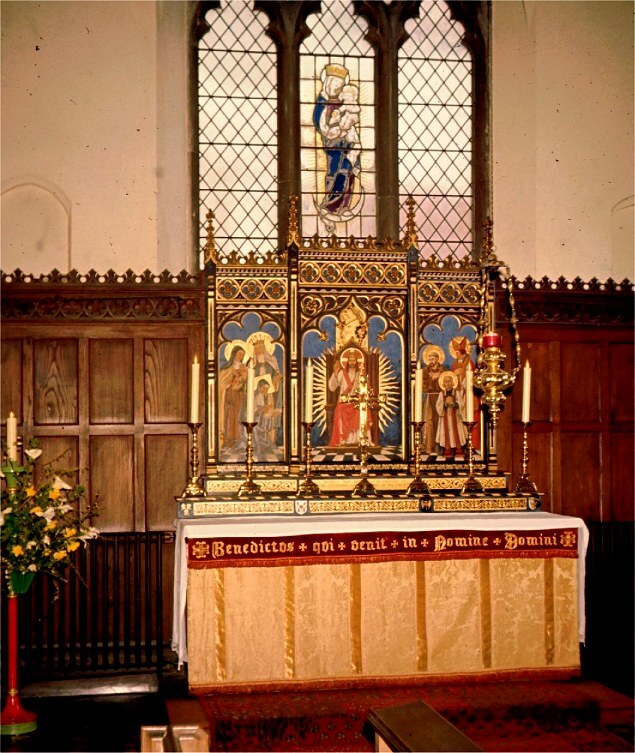 You can see images of it below, and the triptych in situ at All Saints in the early seventies photographed by Roger Smith. 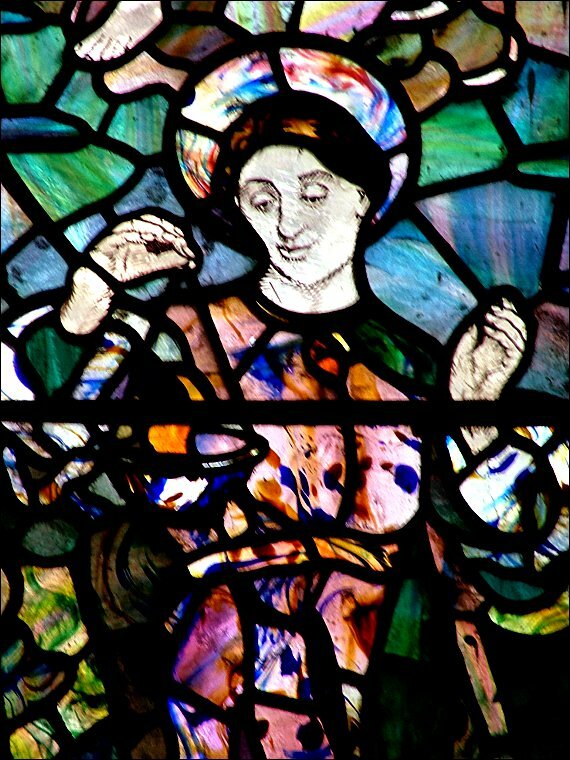 The white walls and the open spaces accentuate the colour of the triptych, and there is another intense blast of colour at the east end, in the form of the window by Leonard Walker. Walker worked in an expressionist style in the1930s, and I had seen one of his lovely windows a few weeks before at Southburgh. But this one is two decades later, and it is absolutely gorgeous. 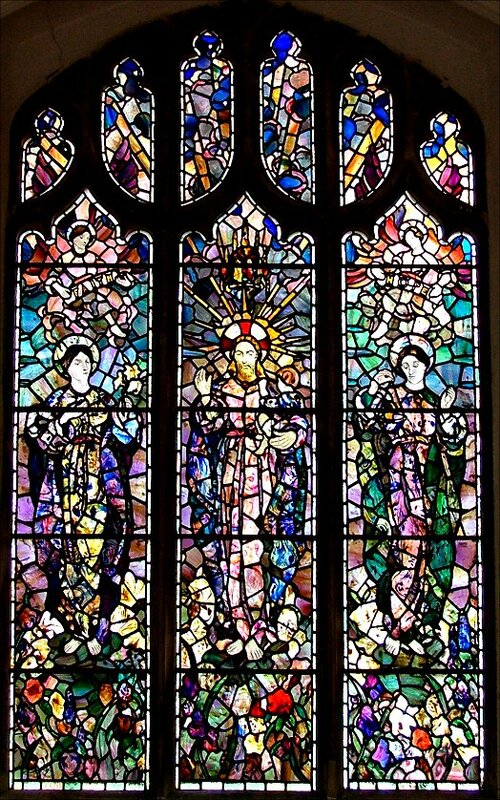 It depicts Christ in Majesty flanked by the figures of Faith and Hope. The move in a flowing, sinuous manner, but it is the colours that are remarkable; it really looks as if the glass has been tie-dyed. 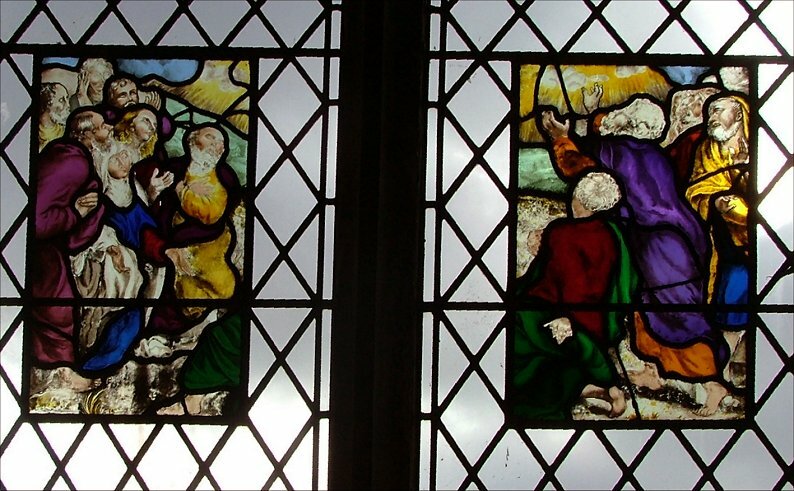 There's more interesting glass in the south side of the nave. 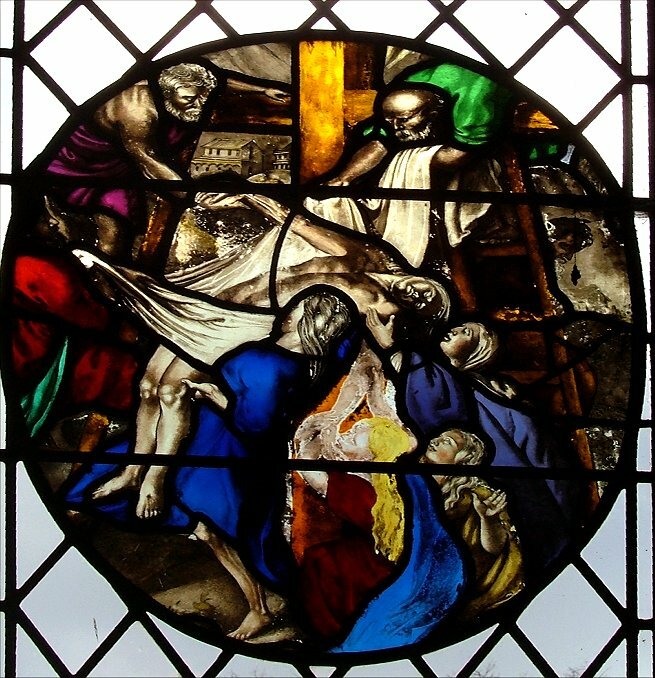 Four Flemish panels, two of them roundels and the other two rectangular, depict scenes from the life and Passion of Christ. 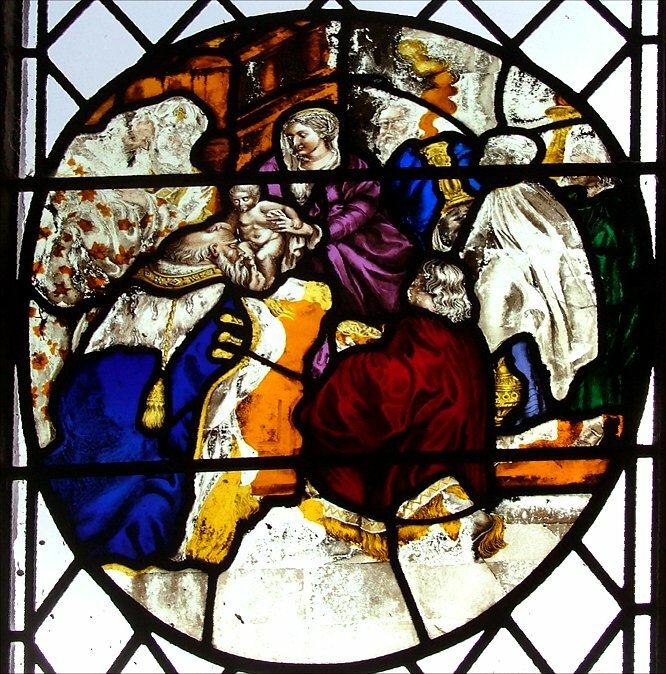 The roundels show the Presentation in the Temple and the Deposition from the Cross, while the two rectangular panels are part of a much larger scene depicting the Ascension. Back at the west end, three curiosities. 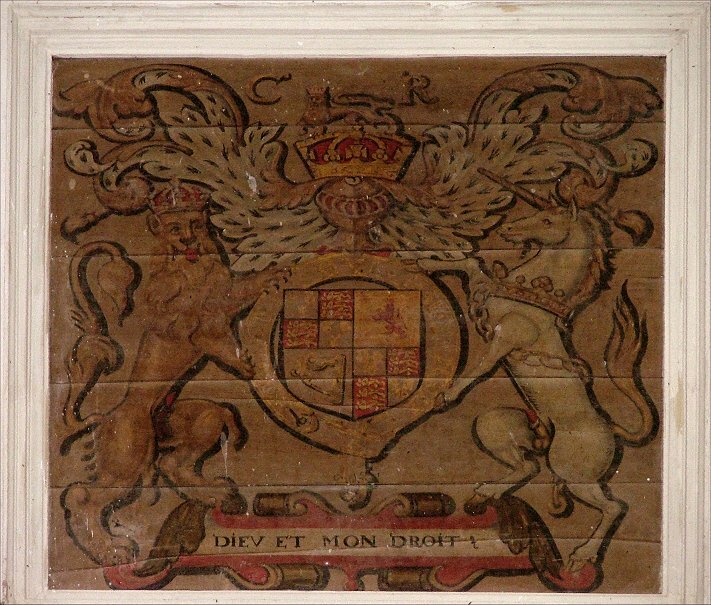 High up on the west wall is a rare surviving Royal Arms for Charles I. 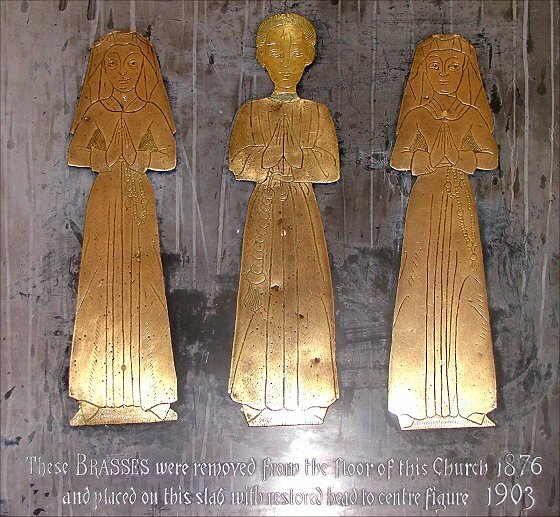 Below it, three brass figures, showing a civilian and his two wives of about 1500. 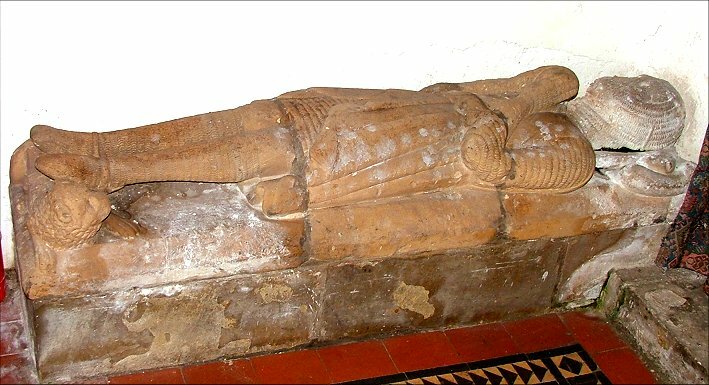 And even older, down in the north-west corner, a crusader reclines, his heart in his hands. His feet are on a heraldic lion, and yet it seems more lifelike than him. If you doubt the weight of his armour, look at the pained expression on that little lion's face.